What is the CLEAN Function? 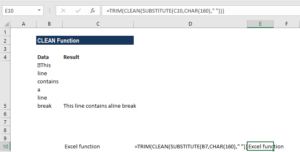 The CLEAN function is categorized under the Text function. The function removes non-printable characters from the given text. As financial analystsFinancial Analyst Job DescriptionSee a real Financial Analyst Job Description including all the skills, experience, and education required to be the successful candidate for the job. Perform financial forecasting, reporting, and operational metrics tracking, analyze financial data, create financial models, we would often import data from various sources and the CLEAN function would help remove nonprintable characters from THE supplied text string. It is also useful in removing line breaks. The function was introduced to remove the non-printable characters represented by numbers 0 to 31 in 7-bit ASCII code, which are often found at the start of data imported into Excel from other applications. Text (required argument) – The worksheet information from which we intend to remove non-printable characters. Remember that the CLEAN function differs from the TRIM function, as the former eliminates non-printable characters, represented by ASCII numeric codes 0 to 31. On the other hand, the TRIM function helps get rid of additional spaces that are represented by the ASCII numeric code 32. 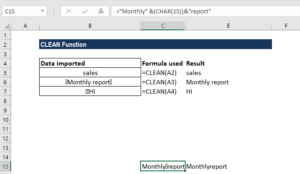 The CLEAN function is a built-in function and can be used as a worksheet function in Excel. 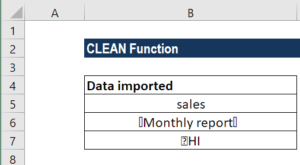 As a worksheet function, it can be entered as part of a formula in a cell of a worksheet. In all the scenario above, the function removed non-printable characters. It also removed the non-printable characters CHAR(15) and CHAR(12). Assuming the data is given in columns A1 to A1000, then right-click the column header “B” and select “Insert” to create a new “B” column. 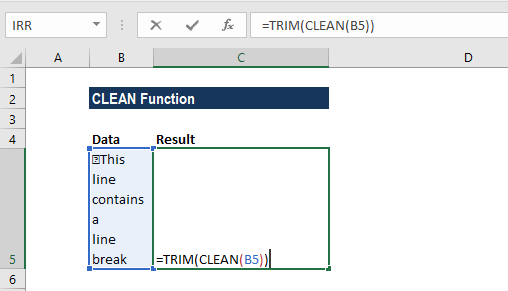 Now, type “=CLEAN(A1)” (excluding the quotes) and then press “Ctrl-Enter” to apply the CLEAN function to the entire selection and clean every data point on our list. Here, we used TRIM, CLEAN and SUBSTITUTE together. The CLEAN function will give the value with all non-printable characters removed. The function was introduced in Excel 2000 and is available in all versions after that. Remember, in the Unicode character set, there are additional non-printing characters. By itself, the CLEAN function does not remove these additional non-printing characters.